From someone who has been living in Toronto for more than two decades, Toronto travel opportunities are magnificent. Canada’s biggest city offers a kaleidoscope of places to see and things to do that will keep you entertained for many days and weeks. In this section you will find countless articles about different facets of Toronto, covering interesting locations, special events and personal travel adventures in Canada’s biggest city. Toronto’s most famous travel destinations include, of course, the CN Tower, Casa Loma and the Royal Ontario Museum, the Art Gallery of Ontario and the Ontario Science Centre. The Bata Shoe Museum and the Gardiner Museum of Ceramic Art are also major draws among museum lovers while the Hockey Hall of Fame caters to enthusiasts of Canada’s national sport. 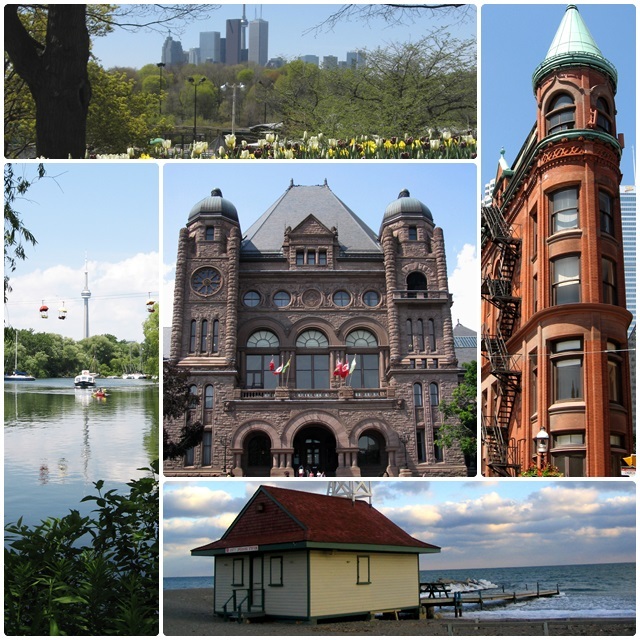 Iconic buildings that you can discover during your Toronto trip include the Rogers Centre – the city’s multipurpose stadium with its retractable roof; Toronto City Hall, an outstanding example of 1960s modernism; Old City Hall, a Victorian masterpiece; and Queens Park, Ontario’s provincial legislature. Some of my personal Toronto travel favourites include visits to some of the vibrant local neighbourhoods, all of which have a unique flavour. In the east end there are Greektown, Little Italy, the Gerrard India Bazaar and the Beach neighbourhood. Moving into the centre of the city you will find places like Downtown Old Toronto and the Entertainment District. A bit farther out from the centre you can explore the colourful Chinatown and Kensington Market areas, the Annex, Queen and King Street West, and moving even farther out you have Corso Italia, the Ukrainian-flavoured Bloor West Village, the Polish neighbourhood of Roncesvalles and many more. The Distillery District is one of Toronto’s most popular entertainment areas and is North America’s largest collection of Victorian-era buildings. For people who enjoy outdoor Toronto travel activities, the city offers a myriad of travel possibilities and places to explore. Among my favourites are the Toronto Islands, a serene nature getaway from the hustle and bustle of downtown that’s just a ferry ride away. Toronto’s eastern and western beaches provide great entertainment for water lovers, beach volleyball players, inline skaters, dog walkers, kite-flyers and many more. Harbourfront has a great waterfront location with lots of restaurants, boat tours and festivals. Toronto has a huge park system with over 360 parks that nature lovers will enjoy. Some of the largest parks include High Park, Humber Park and Rouge Valley Park, which provide great opportunities for walking and cycling. A personal favourite is the Evergreen Don Valley Brickworks, a former brick factory that has been turned into an environmental community centre, surrounded by ponds, meadows and forest. Culture lovers will also enjoy their Toronto travel experiences. The city has a great theatre scene and is the third most important English-speaking theatre city in the world after New York City and London. Classical music is presented at the Four Seasons Centre for the Performing arts and at Roy Thomson Hall. Throughout the year, there are numerous cinema festivals in Toronto, including the world-renowned Toronto International Film Festival every September. Throughout the year, Toronto offers up numerous festivals, from Doors Open – Toronto’s architecture festival, to the Waterfront Blues Festival and the Beaches International Jazz Festival, to Luminato and the Pride Festival, the Downtown Jazz Festival, Salsa on St. Clair, the Toronto Caribbean Carnival and many more. Almost every weekend you will find one or several festivals going on somewhere. We are just scratching the surface here of the things to see and do in Toronto. Whatever time of the year you schedule your Toronto travel experience, you will have a really entertaining time. So check out some of the articles below to get some first-hand travel ideas for Toronto. You may have figured out by now that I am bit of an architecture buff.Well,the great thing is,since 2000 Toronto has its very own free-access architecture weekend where you can get access to more than… Read more. With more than 2.5 million inhabitants in the city, Toronto is Canada’s largest metropolis. Taking into account the surrounding municipalities, the Greater Toronto Area has more than 6 million people. You may have figured out by now that I am bit of an architecture buff. Well, the great thing is, since 2000 Toronto has its very own free-access architecture weekend where you can get access… Read more. There is no doubt that Canada is a northern country and that our winters here in Toronto can sometimes be a little harsh. But that’s no reason to hold anyone back from getting out there and enjoying the… Read more.